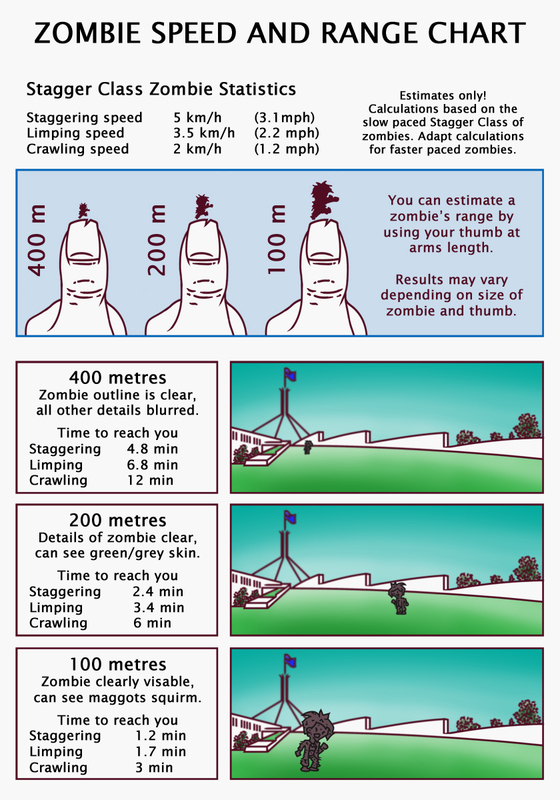 If you are being chased by zombies it is handy to know how far away they are, and therefore how much time you have before they reach you. It can mean knowing when to leisurely sip your latte or gulp it down. So get practicing judging distance. Like an artist you can use your thumb to gauge scale and distance. Basically a zombie will look smaller the further in the distance it is. By comparing the zombie against you thumb held out at arms length, you can learn to estimate how far away the zombie by comparing it's size against your thumb. Not sure exactly how it work, the diagram I found on the internet was in Russian. Anyway the average Australian male is 175.6 cm tall while the average Australian woman is 161.8 cm tall. Hope that helps. Probably not.